Ham and Cheese English Muffin Make Ahead Breakfast Casserole - Home. Made. Interest. This easy Ham and Cheese English Muffin Make Ahead Breakfast Casserole is an awesome brunch recipe that is perfect for Christmas breakfast or New Year’s brunch! I love the holidays and all of the fun family things that go along with it. This month has already been a whirlwind of parties, kids’ activities, and shopping and Christmas is going to be here before you know it. 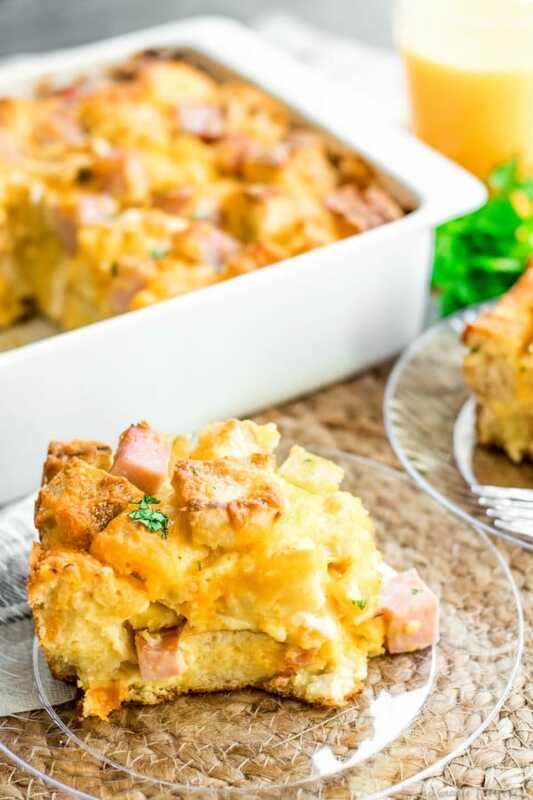 I have a lot of tricks up my sleeve to help simplify the holidays so that I can enjoy my time with friends and family and one of my favorites is this easy Ham and Cheese English Muffin Make Ahead Breakfast Casserole. It was inspired by my favorite fast food breakfast (you know which one I mean) and it’s totally delicious! This make ahead breakfast casserole is perfect for the holidays because you just throw all of the ingredients together and then pop it in the oven. There isn’t a lot of prep work and what little cutting you need to do can be done the night before. Assemble everything in a casserole dish before going to bed and in the morning you whip the eggs and cream together and pour it over the cubed English muffins, ham, and shredded cheese and it’s ready to bake. Super easy great for Christmas morning or New Year’s Day when you want to serve something nice but don’t want to wake up at the crack of dawn to do it. 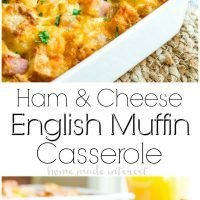 This Ham and Cheese English Muffin Casserole is an easy make ahead breakfast casserole that is perfect for the holidays. Add half of the English Muffin cubes to the casserole dish. Sprinkle with half of the cheese and half of the ham cubes. Repeat with another layer of English muffin, ham, and cheese. Pour the egg mixture over the casserole making sure to cover all of it. Cover the casserole with aluminum foil and place in the oven to bake for 45 minutes. Then remove foil and continue to bake for 15 minutes. NOTE: This casserole can be made ahead of time. Follow the instructions up to the point where you are ready to pour the eggs in. Instead create your casserole layers, cover your casserole dish and place in the refrigerator overnight. Mix your eggs, cream, salt, and pepper, together and place in an airtight container in the refrigerator. In the morning remove everything from the refrigerator and pour the eggs over the casserole then follow the rest of the baking instructions from there. Disclaimer: We are not nutritionists. The nutrition facts for this recipe were calculated using MyFitnessPal.com and may vary with ingredients. Please use this as a guideline only. OMG, my grandkids are going to love this recipe. Going shopping today to get the ingredients! Thanks for sharing. Make ahead breakfasts are the best! Especially when you’re not a morning person. This is the perfect Easter breakfast! I can make it ahead of time and don’t have to worry about more dishes! Adding this to my menu! This casserole looks amazing! I am always blocked when thinking of savoury breakfast ideas. My go-to is oatmeal and pancakes. This is a great way to change things up! This recipe is fantastic. So much flavor! Thank you for sharing it ???? This looks so delicious and would be perfect for easter brunch! I love an easy breakfast recipe to have on hand for entertaining. 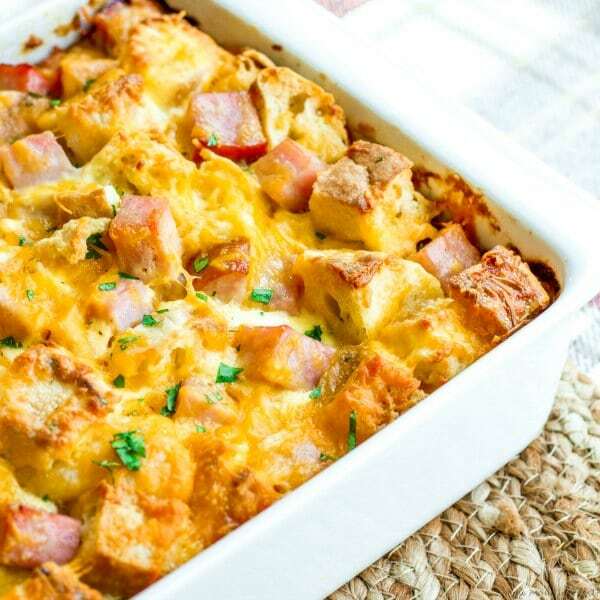 This breakfast casserole it perfect! I have family coming to stay and I will make this for them. Chinet is the ONLY paper products I use so yeah Chinet!! I love this casserole! Sounds so filling and convenient to make! I’m all about yummy food that doesn’t take forever to prep! It is so nice to make things easier on ourselves especially during any kind of holiday. Now we have Easter coming up and using something to make our clean-up is easier I’m all for. 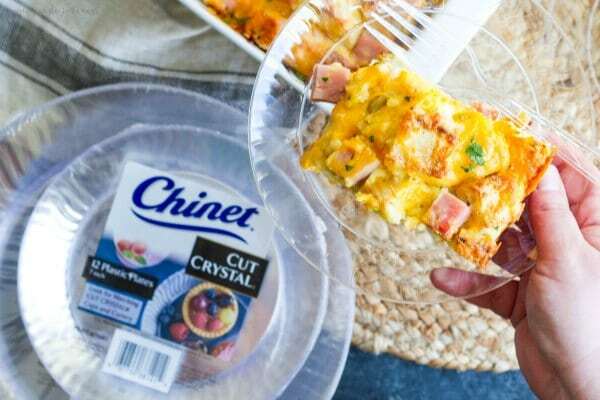 The Chinet plates look a little fancier than just the plain paper plates. And your egg casserole would be great for an Easter Brunch. I love breakfast casseroles, but haven’t used English muffins for them! Great idea, with the nice chewy crust! I love breakfast casseroles, especially for holidays or whenever we have family in town visiting. They are just so convenient and adaptable! Can’t wait to make this for my fam! Love this savoury make ahead breakfast. Usually I find most breakfasts like this are sweet, but with all the Easter chocolates that’ll be around, I love that this is savoury. All of the best flavors! I absolutely love a good ham and cheese sandwich. Definitely an ideal recipe for holiday breakfasts – can’t wait to make it for family! Saute the ham first before adding, makes it more flavorful ???? This breakfast dish was a smashing success with 7 adults….1 who is the pickiest eater in the world! Thank you so much for sharing this!! Happy day to ya! I can’t tell you how happy I am to hear that. Thanks so much for letting us know! Do you think I can substitute sausage for ham? Yes, I would cook it first but I think that would be delicious! Do you use 4 muffins, counting top and bottom as 2 or a whole muffin as 1 count? 8 muffins. Top and bottom make 1 muffin. A coworker told me she made this breakfast casserole for Easter brunch. I had some extra ham left over from Easter dinner. I said, this is a great recipe to try out for breakfast for my wife and bonus sons aka stepsons. They love egg bakes. Made it up in twenty minutes and putting it in the oven. Not even going to waist for breakfast they will eat it for dinner.Thanks for sharing. Looks like a wonderful dish.. Very good recipe, thank you. I need your advice, how much is a high-calorie meal? And then I am engaged in the hall, because I have problems with excess weight, which I try to solve. And my fitness trainer stopped me eating more 2-2.5k calories a day. I know that it is not exactly possible to say how many calories there are, but can you approximately calculate? The recipe is really delicious, I can not tear myself away from this muffin! Hi John, we have updated the recipe with the calories. I’m so glad you are enjoying it! when you call for 8 muffins does that include top and bottom? Yes. You don’t cut them in half you just chop the entire muffin into pieces. Delicious meal. Keep up the good work. Wanderful reciepe! Great combination of flavors, thanks. Thank you very much for sharing this recipe with us. I did something similar for my family for Breakfast, it turned out very tasty, and most importantly nutritious. I like your ideas. Thank you for being with us! Do you have to use heavy cream for this recipe to turn out? Wondering if milk would work? Hi Wanda, you can definitely use milk instead of heavy cream if you prefer.